7th annual Worldwide Knitting in Public Day on June 8 in Galeton's John J. Collins Centertown Park. Knitters, spinners, other fiberistas fiber animals, and providers will gather to join with others around the world to celebrate this day. All ages are invited! Your presence benefits the Galeton Public Library. 18th Does a Bear Knit in the Woods? retreat. Wednesday, April 3 @ 1:00 through Friday, April 5. Those wishing to attend Kinzua KnitAway will go together on Saturday. Contact me for details @ linda@artsyknits.com. 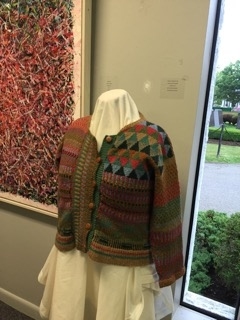 Kinzua KnitAway coming up: Registration for classes open: new vendors coming with lots of temptations, nice on-site lunch provided (reservation required). Great chance to shop local! I was pleased to receive third prize in the Gmeiner Regional Art Exhibit. What a gift Arthur Gmeiner made to the region! Watch for Finger Lakes Fiber Festival coming in September! 17th!!!! Does a Bear Knit in the Woods? retreat will return to Oak Hall on Sunday, September 16. Those wishing can arrive Sept 14 and go together to the Finger Lakes Fiber Festival on Saturday. Contact me (linda@artsyknits.com) for details if you are interested. a rich local fiber event in Warren PA. I am thrilled to be back. Will be teaching all day April 7 - Dress Your Dog for Warmtha nd Style in the morning, Designing Stash lecture over the lunch hour, and Knitting and Waaving with Handspun in the afternoon. Studio Tour at Gmeiner in Wellsboro opening on February 7 at 2. Come enjoy a pictorial tour of area artists - including mine. An imaginative idea! New Noro, 1, 2, 3 Skeins: 30 Colorful Knits just out. It features my Braided Moebius Cowl, published by Sixth& Spring Books. Used by permission. Photography by Rose Callahan and text coppyright 2014 by Sixth and Spring. Used by permission. Shown on Facebook.com/artsyknits. Noro Crochet now published! Here are images of the book and my Flowers and Buttons shawl. Flowers and Buttons from Crochet Noro, published by Sixth&Spring Books. Photography by Rose Callahan copyright © by Sixth&Spring Books/Knitting Fever, Inc. All rights reserved. Used by permission. Party Wrap is in the new Cascade Cowls. Zealana book features Squall Shawl, shown below. Photography by Rose Callahan and text copyright © 2014 by Sixth&Spring Books. Used by permission. the end of the day - it was my evening reward! Knit in Kuani variegated - a dream! Keep checking this page for announcements about upcoming classes, retreats, etc.! Click here to view my calendar. Watch for Pittsburgh Knit and Crochet Festival in March, 2017. 15th knitting retreat at Oak Hall, Brooklyn PA.
Now out. check out my shawl. Does a Bear Knit in the Woods? retreat at Oak Hall on WEdnesday, November 7 at 1 pm through Friday at noon, with the option of staying an extra day. Knitter's Choice with a feature of learning or reviewing the moebius, domino knitting and adapting patterns for size or style details. I am delighted that the new 60 More Quick Baby Knits has hit the stores. The first pattern is one I designed for a very special baby, Alice. The pattern for this shawl is available in Knit Simple magazine and on the Knit Simple website. By popular request, we will do a Knitter's Choice. May 28 at 1:00 toMay 30 at noon. Check attachment for details! Space limited, as I like to keep these events small.